This is a delightful, well-paced recital of early- and mid-18thcentury French music, if not always composed specifically for the recorder then certainly suited to it. In an era when it was fashionable to play an instrument, Chédeville went so far as to suggest that his sonatas could also be played on the bagpipe or hurdy-gurdy (aristocratic Arcadian pursuits)! So keen was he to promote this collection that he published it as being by Vivaldi (hence the reference to Il pastor fido) rather than as his own. The Philidor sonata was composed for the ‘flûte à bec’. Like Chédville, Hotteterre and Blavet were highly esteemed wind players, while Chéron was a keyboard player and Leclair and Dieupart were violinists, yet many of Leclair’s sonatas were sold as suitable for transverse flute or violin. 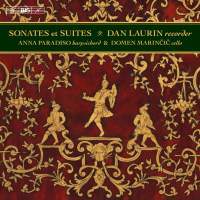 Dan Laurin has, accordingly, assembled a recital of some of the most idiomatic for the recorder. His masterful solo recorder arrangement of Marais’s Couplets de folies (originally for bass viol) represents a departure from the usual arrangements with continuo and not only shows the recorder to fullest effect but also illustrates his own considerable musicianship. Overall, the music is a cosmopolitan mixture of French and Italian styles. My favourite items are the Philidor and Blavet sonatas. Laurin enriches the Lentement of the former with expressive vibrato but it is Philidor’s lively syncopated fugues that give most pleasure. The Blavet is a virtuoso work – the variations in the final movement are definitely not for amateurs – and all the better for being paired with harpsichord alone. Anna Paradiso’s accompaniments are unfailingly sympathetic and stylish. Elsewhere, particularly in the Chédeville and Chéron, the continuo cello part, though beautifully executed by Domen Marinčič, nevertheless overpowers the recorder when playing in its lower register.